Rim: The metal hoop that the tyre attaches to and usually forms a braking surface. Hub: Found at the centre, or hub, of the wheel. This is where cassettes or sprockets attach and the component that attaches to the frame. Spokes: Spokes link the hub to the rim. 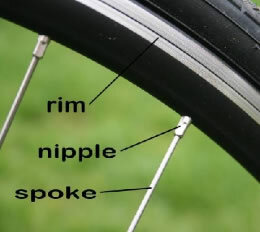 If you notice that you have a broken spoke or the wheel is bent then consult a qualified bike mechanic.